Truck Crashes, Releasing 14 Million Angry Bees : The Two-Way Near Island Park, Idaho, 14 million bees went berserk after a semi wrecked on a highway Sunday. The truck was carrying more than 400 hives; crews finished cleaning what's been called a river of honey off the road late Monday. 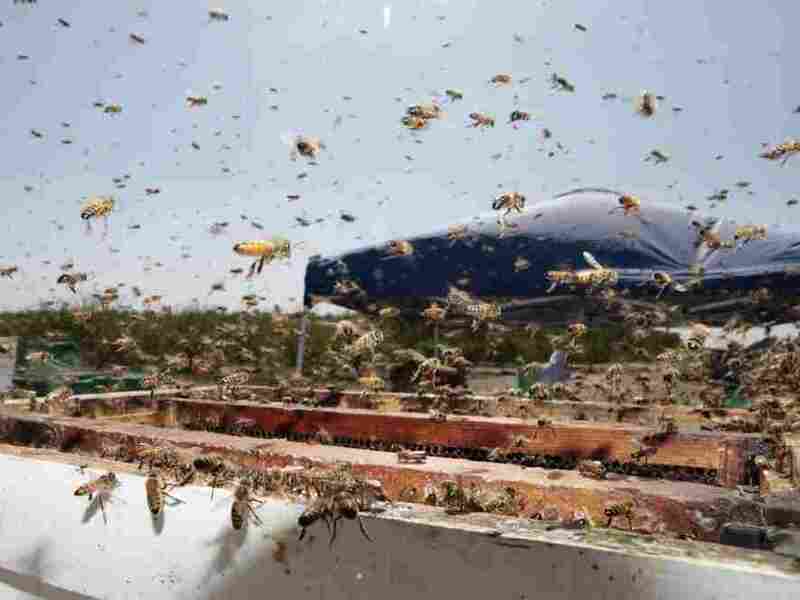 A file photo shows bees buzzing around a hive at a California farm. In Idaho late Sunday, a truck crashed and released its large shipment of bees and honey on the highway. The weekend did not end well for fire and police personnel near Island Park, Idaho, where 14 million bees went berserk after a semi wrecked on a highway Sunday afternoon. The truck was carrying more than 400 hives; crews didn't finish cleaning what was called a river of honey off the road until late Monday. The bees swarmed in black clouds that kept the truck driver and rescue personnel in their vehicles until they could put on protective gear. In the end, it seems that many of the bees were killed after being sprayed by firefighting foam. But while workers were being stung as they tried to clean up U.S. Highway 20, Fire Chief Kenny Strandberg worried about another problem. "I am worried about the bears coming down now — the grizzly bears," he said. The load of bees and honey was headed from California to Minot, N.D. And according to local TV station KIFI (Local News 8), "It is not unusual for semi-trucks with bees to travel U.S. Highway 20. Strandberg said about three or four trucks come through every week." KIFI reports that the bees have a street value of three cents apiece, meaning that an estimated $400,000 worth of insects were lost in the crash. KIFI sent a Local News 8 reporter to the scene; the resulting piece seems to have been filed under a state of extreme duress, as one roadside "standup" shot devolved into hair-flailing acts of self-preservation before she could speak. You can watch the video. But it should be noted that it's not easy to film bees on the best of days, let alone when they're rampaging along a rural highway that's also likely to become a gathering point for grizzly bears. For any conspiracy theorists out there, who may be wondering why millions of bees are routinely being transported on America's highways, on shadowy semis bound for the Dakotas — check out the entry on bees at the X-Files Wiki.